During the 17th and 18th centuries, Cozumel became a favorite hideout for pirates, who ambushed and sunk many cargo ships off of the island's shores. 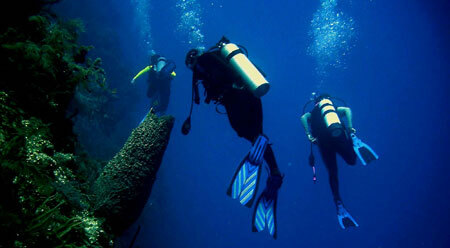 Consequently, divers love the ocean floor surrounding Cozumel. The many ships and colorful reefs provide a diving experience unlike any other in the world. A relatively small island just 29 miles long and 12 miles wide located just off the coast of Mexico, south east of Cozumel and due east of Playa Del Carmen. There are many reasons why Cozumel is one of the best, most popular and most affordable vacation and dive destinations in the World. Cozumel has long been renowned for its amazing diving. Its underwater wonders include the world's second-largest reef network featuring limestone caves, tunnels and rare black coral. Dive enthusiasts can enjoy diving year around as water temperatures range from 77°-82°F (25°-28°C) throughout the year. The other reason Cozumel is a favorite destination of divers is that there is a remarkable amount of things for the NON-DIVER to do. In addition to the perfect year-round weather, beautiful beaches and crystal clear water, there are many fine Cozumel restaurants, fun shopping experiences (where haggling can be taken to a new level) and a wide variety of Cozumel nightlife from party-all-night bars to quieter jazz clubs. Whether you're a diver or non-diver, Cozumel is a great place for those looking for fun, sun and relaxation.